I began studying Buddhism, its three main schools, and the many traditions and lineages within each, when I was only a teenager. Though all descend from the teachings of the first Buddha, who was born Siddhartha Gautama, the lineages of traditions in our world today are quite different from one another. The oldest and the smallest of the main branches of Buddhism, according to the population of adherents, is known as Theravada (pronounced Taar-Ravada), which means School of the Elders, and is mostly found in Thailand, Sri Lanka, and other parts of Southeast Asia. Theravada is mostly practiced through the monastic lifestyle as it is very orthodox in its tenets and beliefs. The largest and second oldest branch of Buddhism is known as Mahayana (pronounced My-E-Yawna), a word meaning the Great Vehicle, which refers to the particular method taught to adherents in their path to enlightenment. Though the highest populations of practitioners is in Asia, many people around the world practice this version of Buddhism through one of eight schools or lineages. The second largest and most esoteric is known as Vajrayana (Vatch-Ree-Yawna) and includes the well-known Tibetan Buddhist leader the 14th Dalai Lama. Vajrayana emerged from Mahayana sometime between the 3rd and 13th centuries, carrying along with it a worship of deities that are heavily influenced by ancient Indian beliefs. Things get complicated within each of these branches of Buddhism, as they all have many sub-branches and schools of tradition within them and lineages of teachers. Sometimes these lineages are passed down from father to son, sometimes they are passed on to revered students, or the helm may be passed on to believed reincarnations of previous teachers through a process known as divination, where they are enthroned with a title. This divination process is how Tibetan Buddhist leader Tenzin Gyatso earned the title of the 14th Dalai Lama. Because both Vajrayana and Tibetan Buddhism emerged from Mahayana, both traditions are also influenced by Yogic and Tantra practices from India. Tibetan Buddhism is one of the most well-known traditions of Buddhism in the West, in all there are seven different schools within this tradition alone. 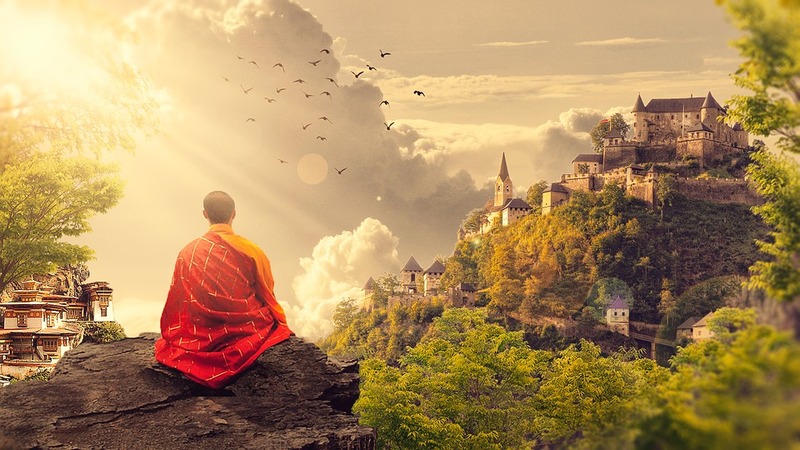 Shambhala Buddhism, which was officially established and is currently led by Sakyong Mipham Rinpoche, the son of famed spiritual leader Chogyam Trungpa Rinpoche, is a well known tradition of Buddhism in the United States and Canada. Rinpoche, pronounced Rin-Po-Shay, is a title meaning honorable. Along with other titles within Buddhism, it’s given to those who have reached a high level of understanding and respect within various lineages of the branches of Buddhism. Titles can be given by birth, experience, status as a reincarnated teacher, or be granted by those of a higher ranking out of admiration or respect. Other titles within Buddhism include Lama, Tulku, Karmapa, Dorje, Roshi, Thich, just to name a few. It was during the study of Zen Buddhism, another sub-branch of Mahayana, that I came to know Thich Nhat Hanh, a Vietnamese Zen monk who greatly impacted my life. Most Zen Buddhists do not worship deities through mantras or yoga, but instead place a lot of attention on being mindful of every moment of life. Through Koans, which are phrases or questions from Zen Masters, students meditate on the lessons or meanings intended, essentially forcing them to think abstractly about the world and about life. I also studied Nichiren, pronounced Nee-Chee-Ren, Buddhism which originated during the 13th century in Japan by a monk of the same name. The practitioners of this tradition place a lot of value on chanting the mantra Nam-Myoho-Renge-Kyo, a mantra derived from the Lotus Sutra. Mantras are essentially just like prayers spoken by followers of the Abrahamic religions, but depending on which tradition of Buddhism you adhere to, the value, purpose or intention behind these mantras can change. By this I mean that some mantras are chanted with the equal intention of Christian or Muslim prayer, by which the devotee is hoping that a Buddhist deity will hear his or her pleas or praise. In other traditions no such belief exists and mantras are solely meant to raise the mindfulness of the practitioner, to reach higher levels of clarity and peace. Mantras can be chanted aloud, repeated below the breath as a part of mindful breathing, and can be counted by using a Mala. Malas are the Buddhist version of prayer beads, similar to the rosary in Catholicism, the lestovka in Old Orthodox Christianity, japa beads in Hindu and Yogic traditions, and the misbaḥah used in some sects of Islam. The mala can come in various sizes, styles, and the number of beads can very, though the most common is 108 beads. The number 8 represents the Ashtamangala, a collection of gifts received by Siddhartha Gautama after he reached enlightenment (nirvana), but are also considered auspicious symbols in other religions in and around India. These symbols in no specific order include the conch, a pair of goldfish (sometimes Koi), the eternal knot, the sacred lotus, a vase, a parasol, victory banner, and the Dharma wheel. Each item holds a specific meaning that varies within each Indian religion. Like all other world religions, Buddhism has several sacred texts, known within the traditions as the Pali Canon and the Sutras. The Pali Canon is the teachings of the first Buddha, Siddhartha Gautama and his disciples and scholars, in a collection of ancient writings recorded in their original Indian language of Pali. They were recorded sometime in the year 29 BC by the Fourth Buddhist Council in Sri Lanka, 454 years after the death of Siddhartha. Prior to being recorded in text, these teachings were spread by spoken memory, recited aloud by those who had managed to memorize the teachings. The Sutras on the other hand came later, covering a span of two hundred to four hundred years later and containing more than two thousand texts. The most well known sutras are the Lotus Sutra, the Heart Sutra, and the Diamond Sutra. Reading from the Pali Canon or the Sutras, you quickly learn that the tone of these documents are much different than the Holy Bible or the Qur’an. The reason for this is the man or his disciples from whom the texts were transcribed from. Siddhartha Gautama never believed himself a prophet for some creator, nor a demi-god, he was merely a man who found his way to nirvana, an inner peace found through complete separation from the self. The teachings of Buddhism are complex and vast. Different traditions practice different variations and interpretations of these teachings. For any young monk joining a monastery within any of the three main branches of Buddhism, awaits a life long journey of reading, learning, and practicing, which includes memorizing the particular branch’s interpretation of the Buddha’s teachings, along with any other teachings of venerated individuals who followed the life of the Buddha. In the cycle of life, known as samsara, there is suffering and a student of Buddhism must acknowledge this suffering in himself and all others. A student must come to understand this suffering, to discern its origins; where it came from, why it arose, etc. Because the suffering has a source, it must also have an ending. Therefore, a student must discover what is the cessation of suffering. Once discovered, a student must practice and attain the end of suffering within himself, and go out into the world and assist others in the ending of their suffering. While these four truths may seem really simple and easy to understand, there is a whole lot more to each of these lessons than I could put into an article. The question of what is defined by suffering is debated within the branches of Buddhism and within the sub-branches of each of them. How to go about ending whatever definition of suffering you ascertain is another topic of disagreement. And whether or not a student should concern themselves with ending the suffering of others and not focusing solely on his own liberation from the self (nirvana/enlightenment) is a major divide between Theravada and Mahayana Buddhism. It was once believed that only the most devout adherents of the Buddha’s teachings, those who followed the most orthodox tenets and practices, could ever reach nirvana, and that this path was intended for only those who led a strict monastic lifestyle. This is what caused the break in Theravada Buddhism, as some practitioners disagreed with this and concluded that the common people could also reach enlightenment. From this disagreement arose the Mahayana tradition, the Great Vehicle by which many could follow the path to enlightenment. Right View: Attain moral perception, ethical behavior, and realize the consequences of the accumulation of karma. Right Intention: Enact the renunciation of the ego, of negative or harmful action, addictions, habits, desires, and thoughts. Right Speech: Speak and embrace the truth, uphold your integrity. Right Action: Embrace nonviolence, uphold dignity, compassion, and loving kindness. Right Livelihood: Practice non-attachment, be minimalist, turn from greed and living in excess, serve others, and give to those in need. Right Effort: Be honorable in your thoughts and your actions with others. Right Mindfulness: Become mindful of the interconnections of everything. Right Concentration: Practice meditation, transcend the self, reach enlightenment. Siddhartha Gautama gave many teachings during his lifetime to those who would listen, but there are three that stand out in Buddhist literature. These lectures consisted of the Four Noble Truths, the detachment from the ego and the embrace of the practice of compassion, and the realization that each human has their own Buddha nature. He gave them after he reached nirvana under a Bodhi tree, and each is called the turnings of the Dharma Wheel. The Dharma Wheel represents time, life, and the cycle of samsara (suffering). With every lecture he gave, Siddhartha is said to have turned the wheel, setting into motion the events that could lead Buddhists to finding an end to suffering and thus nirvana. The eight spokes of the Dharma Wheel represent the eight core teachings of Siddhartha through his Eight-Fold Path. Go here to find recommended reading on Buddhism. To learn more about my journey out of Christianity and into Buddhism, Pantheism, and Taoism, follow this link.